The Kankrej cattle are highly prized since these are fast and powerful draft cattle. They are also fair producers of milk. 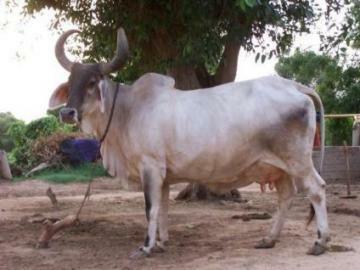 Kankrej are amongst the heaviest Indian breed cattle. The colour varies from silver to grey to iron grey or steel black. The red colour in these cattle has been shown to be due to recessive gene effect. The young calf when born is usually rust red-coloured which gradually disappear within 6 to 9 months. The colour pattern is not uniform, forequarters, hump and hindquarters are darker than the barrel, especially in males. Pigmentation of the skin is dark and the skin is slightly loose and of medium thickness. Hairs are soft and short. It has also been observed that the red color is recessive. The forehead is broad and slightly dished in the centre. Horn are s trong and curved outward and upward in a lyre shaped fashion. These are curved with skin to a longer distance as compared to other breeds. The strong half-moon -shaped horns are covered with skin to a higher point than in other breeds. The face is short, and the nose looks slightly upturned. The ears are very characteristic, being large, pendulous and open. The legs are particularly shapely and well-balanced and the feet small, round and durable. 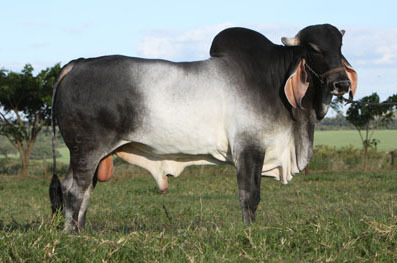 The hump in males is well-developed but not so firm as in other Zebu breeds. The dewlap is thin but pendulous and males have pendulous. The tail switch is black. An adult male weighs average 525 kg (range 550-570 kg) whereas female weighs 330-370 kg (average 343 kg). The gait is peculiar to the breed; it is smooth without any movement of the body, the head is noticeably high and the stride is long with hind hoof laced well ahead of impression of the fore hoof. The gait in Kankrej is locally termed ‘Swai chal’ (meaning royal stride). Kankrej cattle are known to be resistant to tick-transmitted diseases. The incidence of contagious abortion and tuberculosis are also quite low. Production and reproduction: These animals are average in reproduction efficiency. The age at first calving has been found to be average 47.3 months (range 33.9 to 56 months) and calving interval average 16 months (range 13.3 to 21 months). Kankrej are medium milk producers with average per lactation yield of 1750 kg (range 1700 – 1900 kg). The fat percentage ranges from 4.7 to 5.0 % with average 4.8%. Total estimated Population in the state (2007): 26, 81,800 (Source Government of Gujarat). Next: Next post: Heat Stress in Cows: Can it be prevented?